Squats are quadriceps-dominant, multi-joint exercises. The quadriceps muscle group includes the vastus medialis, vastus lateralis, vastus intermedius, and the rectus femoris. Although squats place most of the demand on the aforementioned muscles, they also target the glutes and hamstrings as primary movers. Several other muscles – including the adductors, abductors, abdominals, erector spinae and calves – act as synergists. Elevating the heels when squatting places even more emphasis on the quadriceps muscles, so this exercise is a double whammy for the front of the legs. Squats improve all of the major muscle groups of the body, but they are most geared toward increasing quadriceps mass and strength. They are important for improving all speed-related sports that involve ground contact, including sprinting, football, soccer, baseball, and basketball. Squatting and its related exercises – step ups, split squats, lunges – are many times thought of as the strength development exercises for the legs, as opposed to the family of deadlifts and Olympic lifts, which relate more specifically to power. Heels elevated squats improve the recruitment of quadriceps muscle fibers for a few reasons. Elevating the heels decreases range of motion at the hip and improves range of motion at the knee, helping to recruit more quadriceps muscle fibers. When the heels are elevated, it forces the ball of the foot to make greater contact with the surface. The neural receptors in the feet send signals to the central nervous system to increase recruitment of quadriceps fibers. Heavier loads can be lifted with heels elevated squats because of improved range of motion and improved neural drive. The heels elevated squat is not an exercise for beginners. It is only to be performed by people who know how to squat properly. If you don’t have proper ankle flexibility, do not perform squats with heels elevated. You are going to make the problem worse by shortening your ankles. Place a wedge board on the floor where you will be squatting. Alternatively, use two, 25lb plates to elevate your heels. 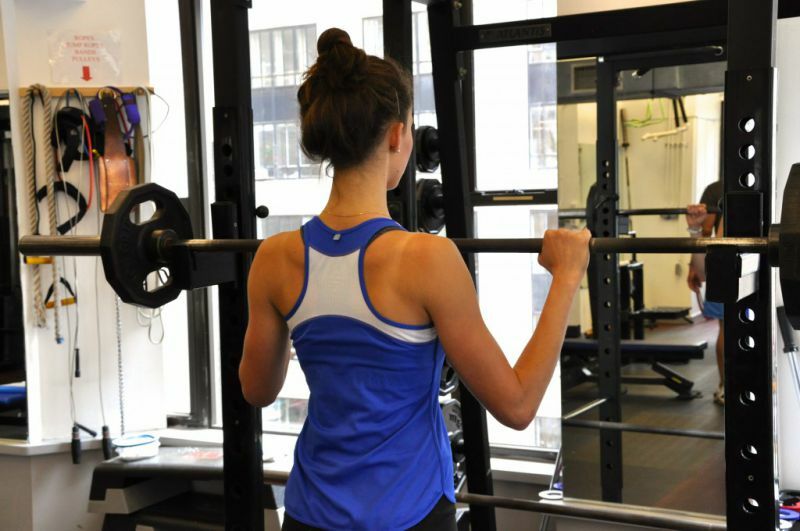 Adjust the squat rack safety catches to slightly below shoulder height, and place a barbell across the rack. 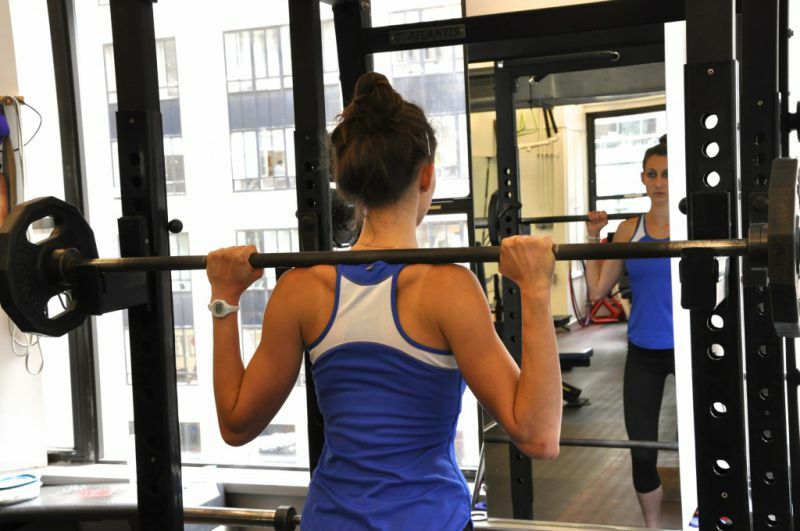 Take an even grip on the barbell and get under the bar, placing it across your upper trapezius (traps). Lift it off the rack. Racking the barbell for Back Squats – take an even grip. Racking the bar for back Squats – step under the bar and place it across the traps. Carefully walk backward to the wedge board, or weight plates, and elevate your heels. Be sure to keep your stance hip width apart. Keeping your spine erect and your lower back slightly arched, inhale as you bend your knees and lower your body in a controlled manner. Perform a full squat until your hamstrings cover your calves, and your glutes are well below your knees. At the bottom of the movement, exhale and drive your body up from the bottom position, maintaining proper alignment of your feet and knees. Maintain an upright torso throughout the range of motion. Keep your lower back slightly arched throughout the exercise. Make sure your feet are completely square. Do not roll the feet in or out during the lift or the lowering portion of the exercise. Maintain proper alignment of the knees, especially when driving your body from the bottom position to the top. Do not let the knees collapse inward. Allow the toes to travel in front of the knees during the lift.